"I saw the black cattle / as the wind whistled through my beard." robin-crafted nests were badges, east and west. and I have burned them in the stove for a dozen more. odd keepsakes in our yard. of broken iron and petals of painted porcelain. for the acceptance to settle in. “Auction” was one of my first published poems outside school literary magazines. As an apprentice poet, I was exploring voice and tone. It derives from personal experience growing up in a small town and portrays the life of the surrounding countryside (near Waynesboro, Virginia). It is light hearted with a few cynical twinges, a comment on the commercial and social aspects of such ‘household’ auctions. “A Roots Reading” is set as well in a small town/country setting, but is a little more first person voice. My attempt has always been to ground abstracts in the mundane to afford a ‘literal surface’ while at the same time using language to its fullest connotation. I want my work to be compelling even as it may seem understated. Hopefully, this is achieved by provoking the reader to question the ‘mystery’ of the piece. Although this piece is in free verse, I frequently write in conventional forms. 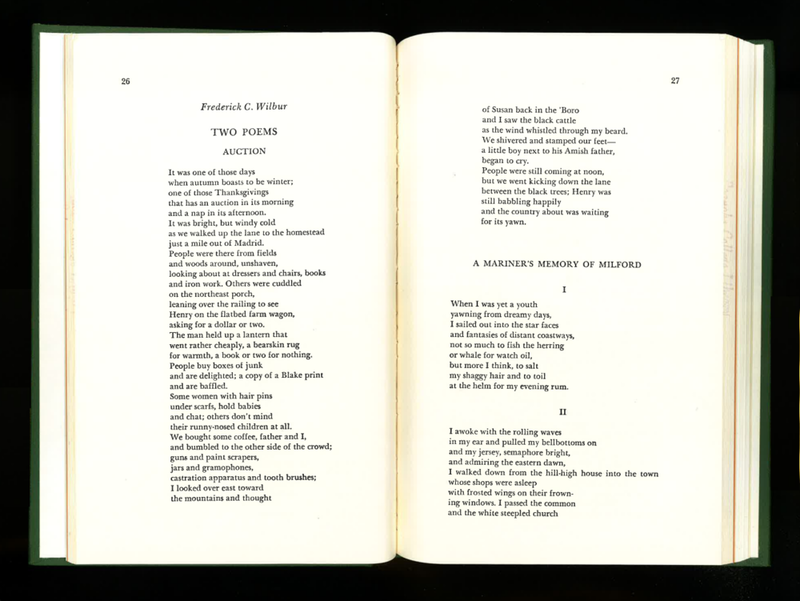 Frederick C. Wilbur's work has appeared in many literary journals including: Shenandoah, The Lyric, The South Carolina Review, Cold Mountain Review, Hampden-Sydney Poetry Review, Southern Poetry Review, The Atlanta Review, The Chariton Review, Roanoke Review, Able Muse, Poetry Quarterly, Greensboro Review, Slant, Appalachian Heritage, Plainsongs, Snowy Egret, POEM, and online, Verse-Virtual, Rotary Dial, and Silver Birch Press. His fourth book, a collection of poetry, As Pus Floats the Splinter Out, is to be published in 2018 by Kelsay Books. He is an architectural woodcarver and has authored three dozen articles and three books on architectural and decorative woodcarving (Guild of Master Craftsman Publications, Lewes, UK). He received a BA degree from the University of Virginia and an MA degree from the University of Vermont. He lives with my wife and family in the Blue Ridge Mountains of central Virginia.